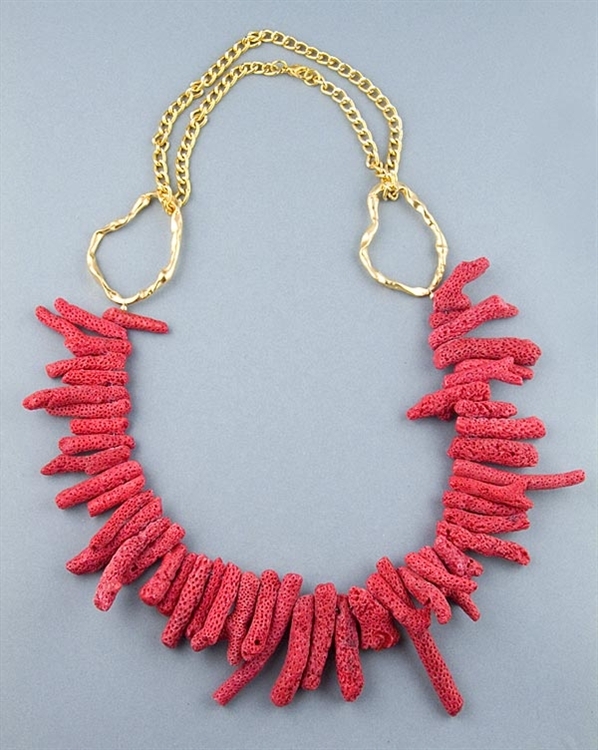 Red bamboo coral necklace by Paula Rosellini. This striking gemstone necklace features a strand of red bamboo coral twigs set on two unique organic shapes and a gold platted diamond cut chain. Necklace measures 64 cm (25.3") in total length and fastens with a 18k gold vermeil sterling silver lobster clasp. You can vary the length on the necklace by doubling the chain in order to become shorter or replace the chain with white satin or fabric ribbons for a fun and playful look. A unique designer necklace easy to wear all day and can also make a wonderful gift. Available exclusively in the UK from Farfallina.net Jewellery Boutique.